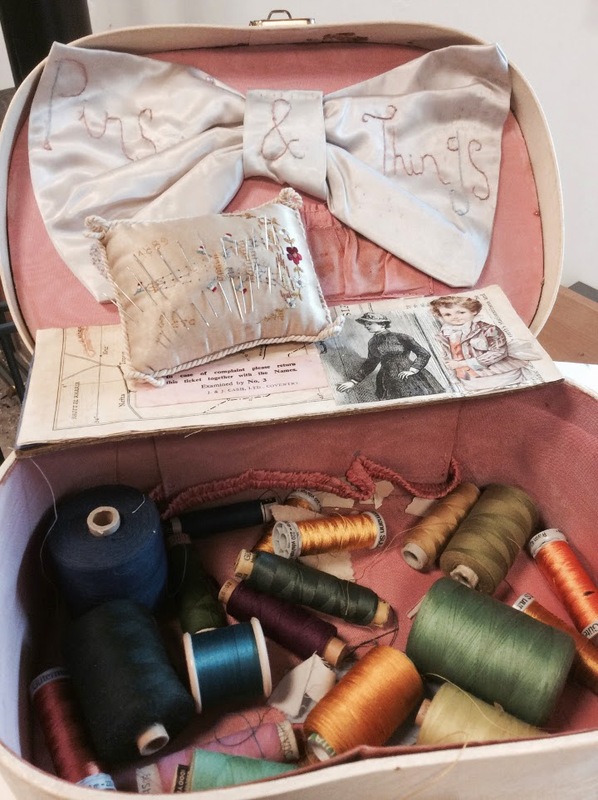 Mooshie Stitch Monday: Visiting the Mountmellick Embroidery Museum and Buying Supplies! A few weeks ago I was lucky enough to travel to Ireland to see one of my best friends get married. 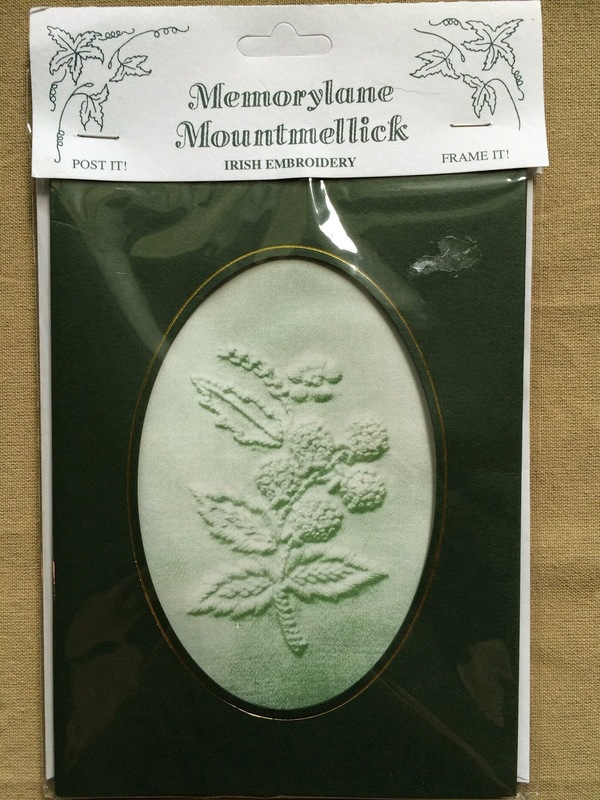 I have been planning this trip for over a year - so back when I was researching different whitework techniques and found out about Mountmellick embroidery - I knew I wanted to visit the town while in Ireland - especially when I found out there was an embroidery museum! Because of a few last minute itinerary changes - the only day we could get to Mountmellick was on the very last day we were in Ireland - which meant getting there all the way from Northern Ireland. My sister-in-law Anne was with me on the trip and thanks to her awesome driving, we made the 5 hour drive all the way down to Mountmellick with an hour to spare before the museum closed!! We arrived at the museum and one of the ladies who works there, Orla, was kind enough to open the exhibit and show us the amazing embroidery. It was pretty amazing seeing these embroideries in person for how old they are. I mean, a quilt embroidered back in the 1870s??? An embroidered dress and cape dating back to the 1890s?? Wow. There were pillow shams, doilies, tablecloths, etc. All beautiful and looked at though they were stitched just last week! I feel bad - but have no photos to show you of the beautiful work on display. Side Note: The photo above was only taken because it was a dress on display that was not behind glass and was recently stitched. That is the only reason we took a photo of it. All of the original old embroideries were behind glass and had the signs for "no photos please. Just to be clear. Here is a photo of the embroidery museum from their website - to give you an idea of what it looked like inside. It was lovely speaking with Orla about the history and the pieces on display. She explained they are trying to keep the embroidery alive by teaching all the children in town the technique. 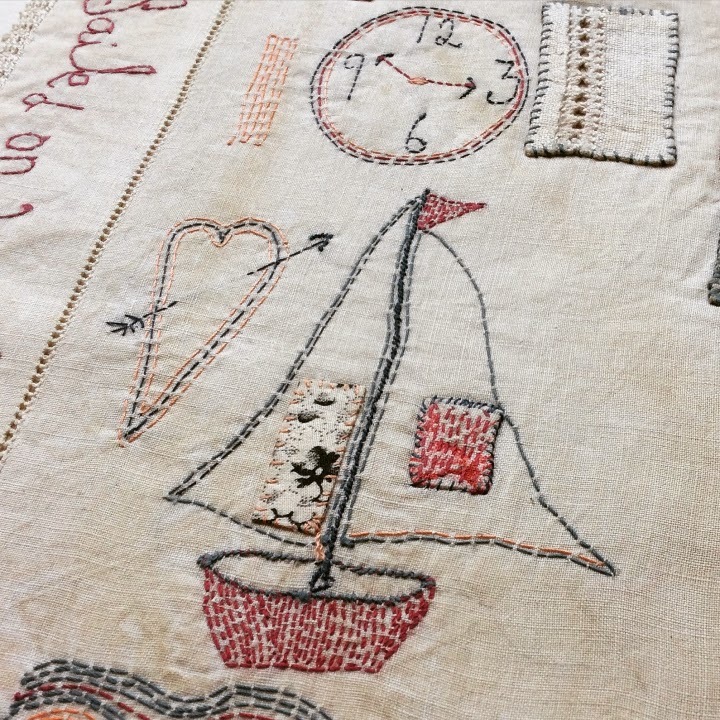 They offer classes and workshops on Mountmellick embroidery throughout the year too at the museum. She says the museum averages about 300 visitors a year. But the best part was that they sold supplies! It was hard not to buy everything, but I managed to get quite a few things! 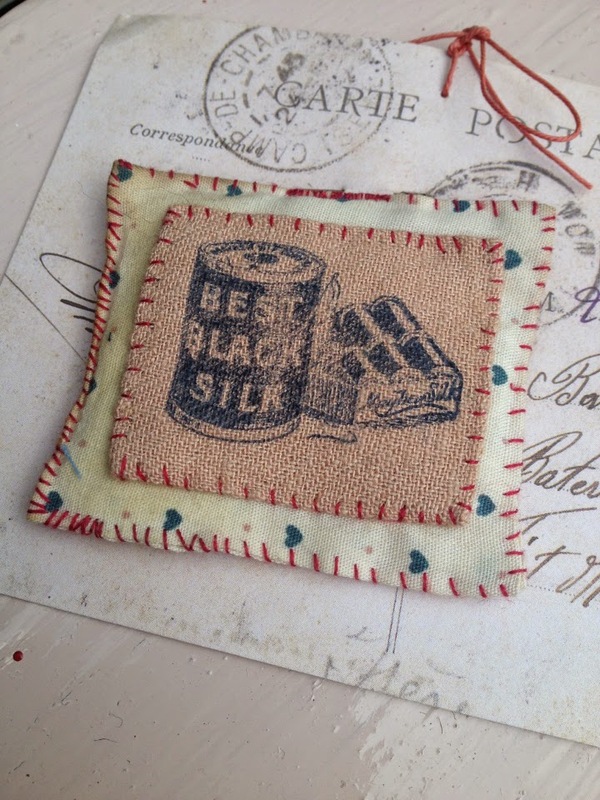 Cotton thread, needles, satin jean fabric. 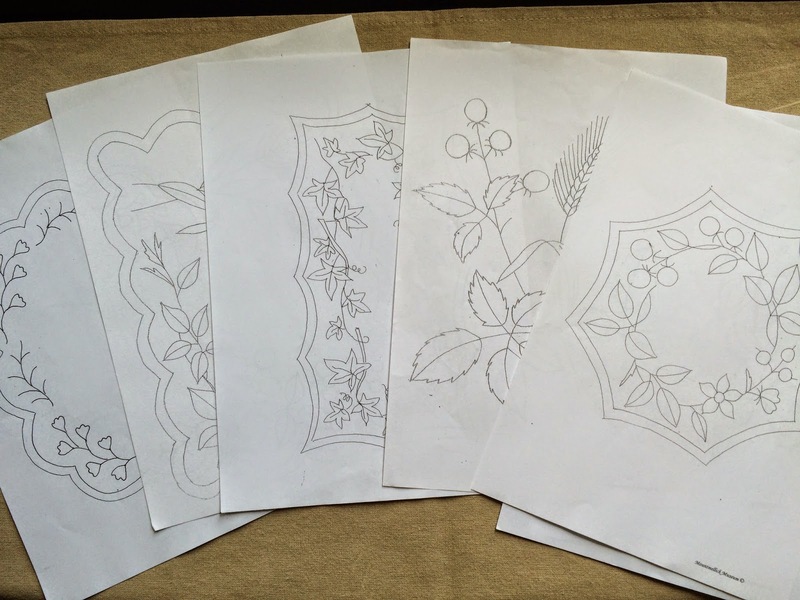 I also purchased some embroidery patterns that are some of the original Mountmellick designs. 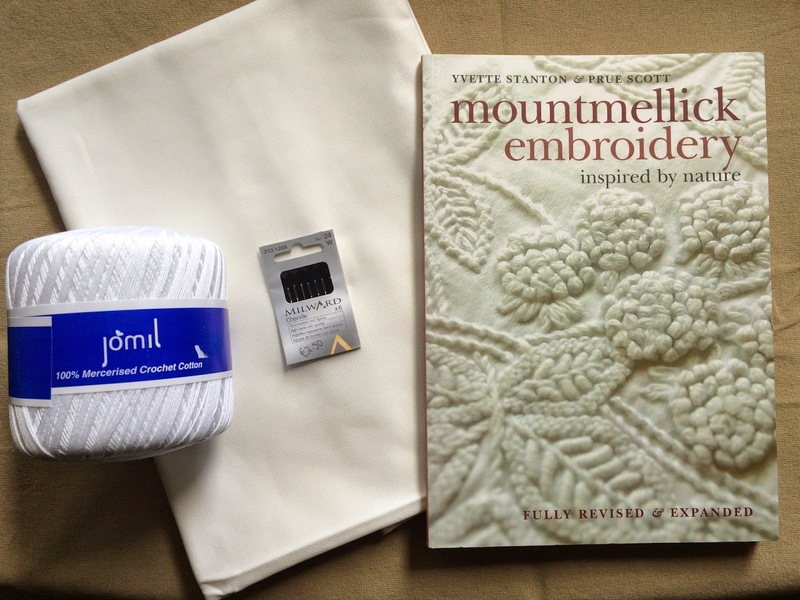 So - I will begin my first "real" Mountmellick embroidery project with this little kit I purchased there. 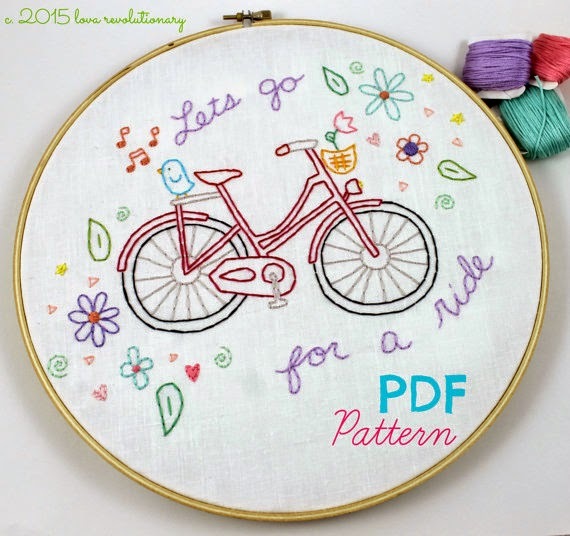 It includes some history, fabric, thread, needle, stitch instructions, and a little paper frame for the finished project. Sorry for the lack of actual embroidery photos this time, but next post I hope to show you my stitching progress on the kit above! 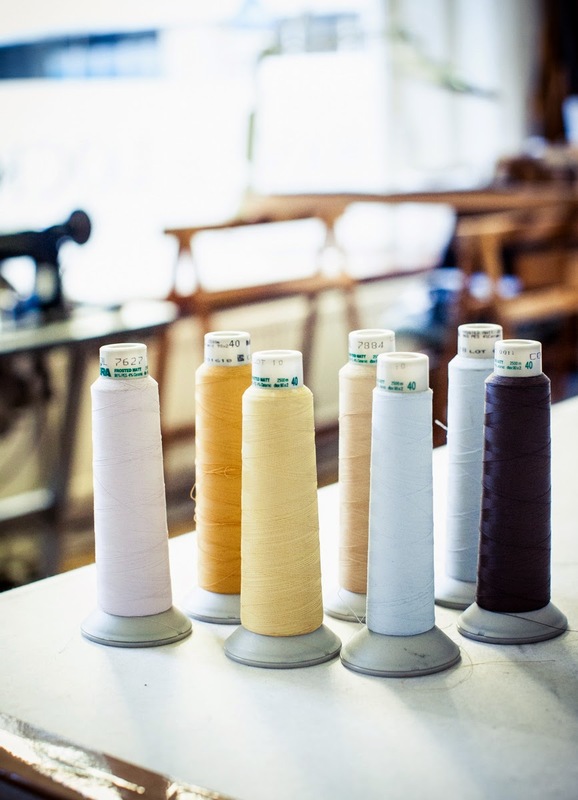 Check out the Mountmellick Embroidery Museum's website for more information on the history of Mountmellick embroidery and here for more on the Quaker Heritage. 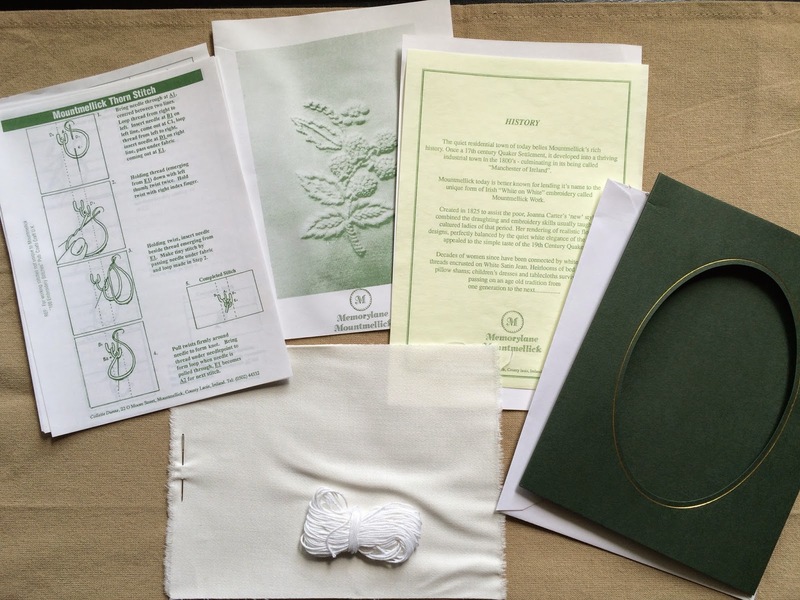 Want to purchase embroidery supplies directly from the Museum? Here is a link to their online shop!! 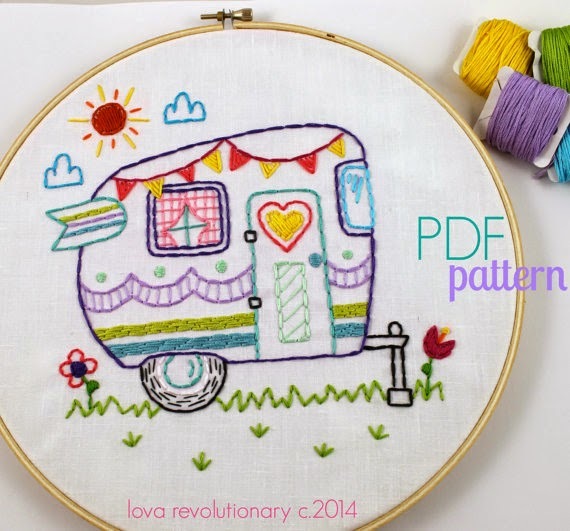 I'm getting a real sense of Spring and movement in Lova Revolutionary's patterns at the moment, they just make me want to grab my needle and hoop and get outside and do some stitching! Because after all, no holiday whether it's a week long jaunt or just a day trip is complete without a spot of embroidery! This week I am going to tackle the million dollar question: Are unpaid internships a fair exchange? I expect that you have an opinion on this subject and it would be great to open a discussion and read your views. The debate about unpaid internships has recently erupted during the run up to the British political election. Should the U.K. Labour party gain power they promise to introduce a time limit of four weeks on unpaid internships. 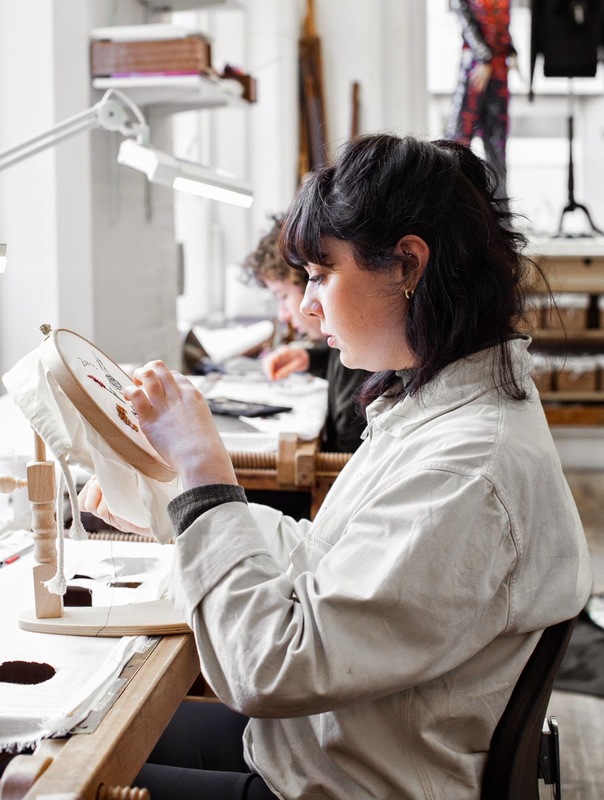 In the U.K. internships have become a recognised path to gaining a first level position in many work sectors from fashion, media and music to finance and technology. The Labour party argue that unpaid internships block the job market by restricting access to this fundamental first stage in many competitive careers to only the wealthiest individuals. Last year many corporations stated that almost half of all graduate positions would be reserved for those who can demonstrate previous work experience. Naturally students and graduates relax their work rights in order to follow their passion. According to the Independent, an average unpaid internship in the U.K. lasts three months and in London it usually costs more than £930.00 per month in living expenses. (article) This is not a venture one could embark on lightly and obviously requires a great deal of funding. Fortunate students and graduates are funded by their parents, however this is not the only route. Many people take a weekend or evening job to supplement living costs. In my case I have used savings and I would suggest that taking a year out to work and save some cash is a possible solution. When googling 'Fashion Internships' a host of horror stories can be found. 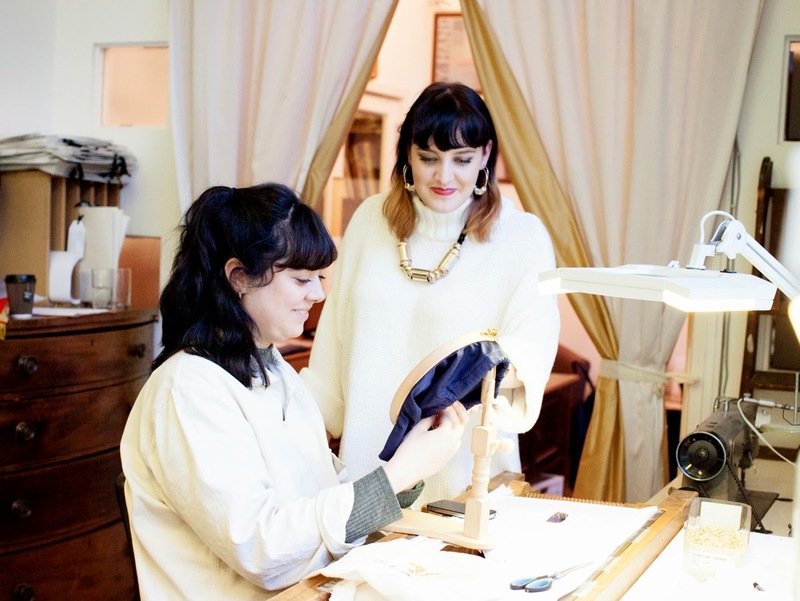 Big and small fashion houses rely on interns to carry out an integral job. This begs the question of how these companies’ business model is structured; by using free labour huge savings can be made. Some designers have stated that their business simply wouldn't survive without interns. 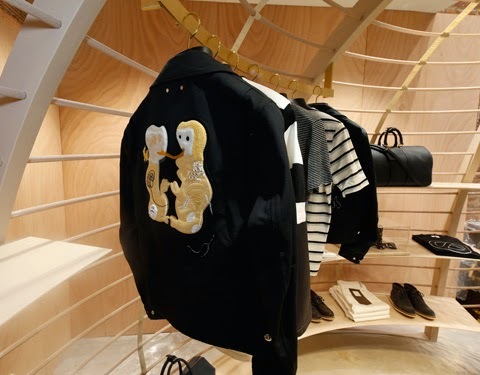 Cozette McCreery of Sibling resigns that “Their (interns) time is important and their input into the workings and production of a collection is really vital.” (article). No wonder that interns struggle under the pressure, or worse, not only from a colossal 12 hour day and 80 hour working week but the absolute necessity to work at great speed and produce impeccably perfect results as though they had been doing the job for years. Obviously this means that the end result may suffer and the consumer has to also pay the price for this oversight. Is this business behaviour more a reflection of the entire industry? The fashion industry is known for scandals regarding the treatment of paid factory workers, for instance. Much of the Italian high-end fashion is produced in unscrupulous sweatshops spread across Northern Italy where Chinese immigrants are brought over illegally to work in squalid and cramped conditions. In contrast my experience at Hand & Lock has been beneficial to me and I have learnt a great deal. From the beginning the staff have been very accommodating by agreeing to a four day working week as well as informing me that a working day starts at 10:00 and finishes at 16:30. The majority of my day is filled with embroidery based work and my colleagues are on hand to ask for advice and feedback. After only eight weeks here, I feel like I’m part of the extended Hand & Lock family. This is a far cry from some other intern’s experiences. I support the importance of work experience for graduates or somebody entering a field of work, whether it is paid or not. The confidence and practice garnered will hold me in good stead for the future whether it leads directly to paid employment in the industry or not. On the other hand where internships are misinterpreted by employers as a replacement for a paid position and the eagerness of the worker is exploited, perhaps here in the U.K, a new law and better investigation by the authorities may lead to a positive change. It could also provide clarity to business and re-affirm a benchmark for business standards. The big names are not always the best option as sometimes you can learn more from a company that is in its initial stages of growing the business. Remember that within each industry these ‘horror’ experiences are well known and it is preferable when seeking further employment to be clear about what you expect for yourself in terms of payment and rights. Please join the debate by commenting below - I look forward to reading your experiences. 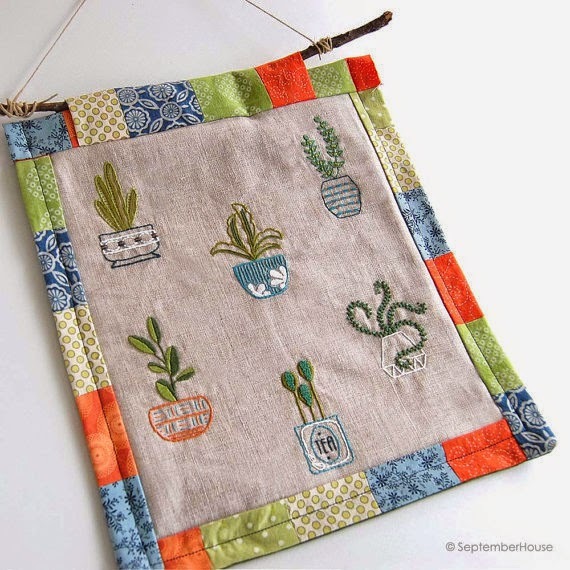 I love the new pick and mix style houseplants pattern by SeptemberHouse. The pattern has the plants and the containers separately, so you can choose which plant goes where, I love all the possibilities that gives you! Allison Murray at Dream a Little Bigger is amazing! 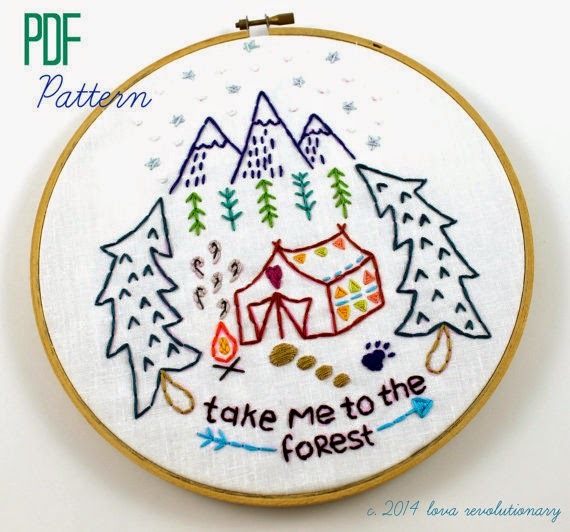 Her website is full of awesome crafty how to's like this tutorial on how to make album art work embroidery. This is so brilliant! It is one of those, "why didn't I think of that" moments. She gives you easy to follow step-by-step instructions so you can become a pro at turning your favorite band art into a needlwork masterpiece. 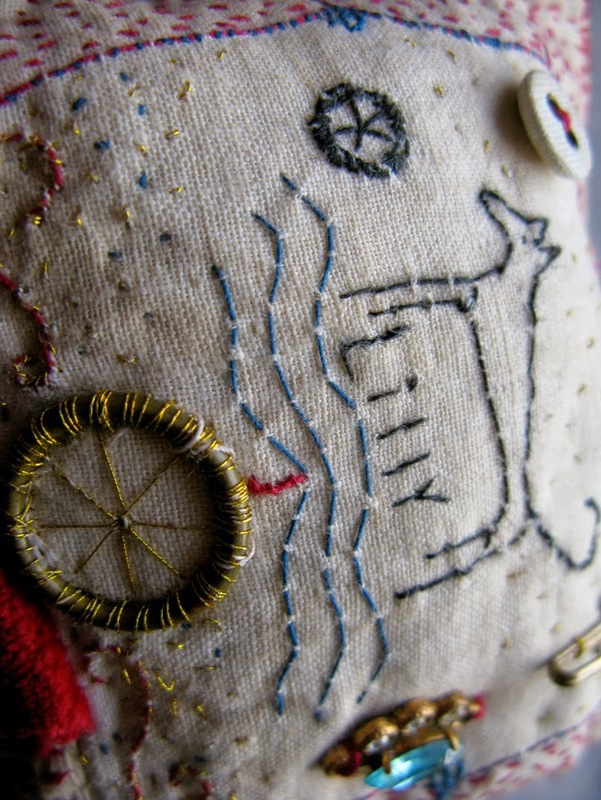 You can see more details and other amazing embroidery on her blog HERE. We have our random winner in the brooch giveaway! My dream studio would have very good natural light and possibly a view on a garden. Inside at least two big tables and dressers with space to show beautiful things and space to hide mess. A super comfy armchair and a cat! Thanks to everyone who entered our giveaway - to Karen Thiesen for the wonderful interview with artist Jessie Chorley - and of course thanks to Jessie for the beautiful brooch! 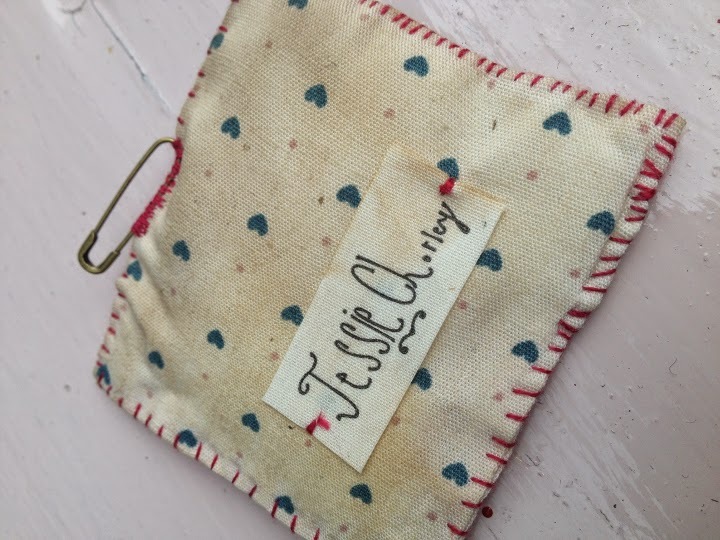 Interview with Jessie Chorley - and brooch giveaway! Once again, I am so pleased to bring you an interview by Karen Thiesen from www.womanwithaneedle.com - today, Karen interviews London-based artist Jessie Chorley. Jessie will be teaching a workshop in Santa Fe, New Mexico from September 15-19, 2015. Jessie also handcrafted a gorgeous brooch to giveaway today! 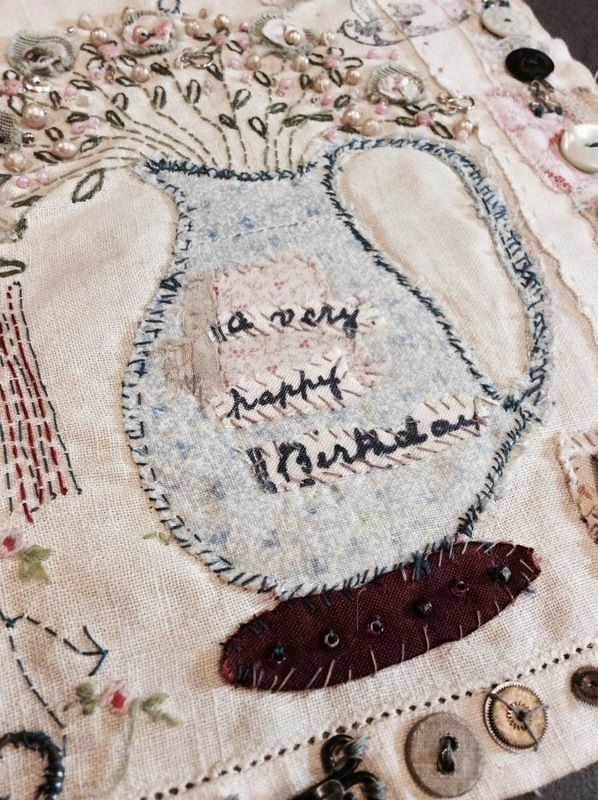 Read on to learn more about Jessie Chorley, her art, her studio, and her inspiration. You work with both paper and fabric. Do you prefer one over the other? I would honestly say I find both incredibly inspiring to work with, I could not choose. I constantly work combining both together as I love the strength of the more robust fabric against fragile papers. I am an obsessive collector of both found paper and fabric but I do like to use my collections. I have a small selection that I refer back to for inspiration but a lot of what I collect I really do use up at quite a pace. This is why I love having my shop as it gives me the opportunity to collect and pass these things on with a new life and a new beginning. To see some one walk away with one of my Altered Journals, for example, is like a completion to the story. My home is not crammed full of my collections but quite ordered. I love to display some things in my home for a certain amount of time and then they may head down to the shop or to the studio if needed for a particular commission. 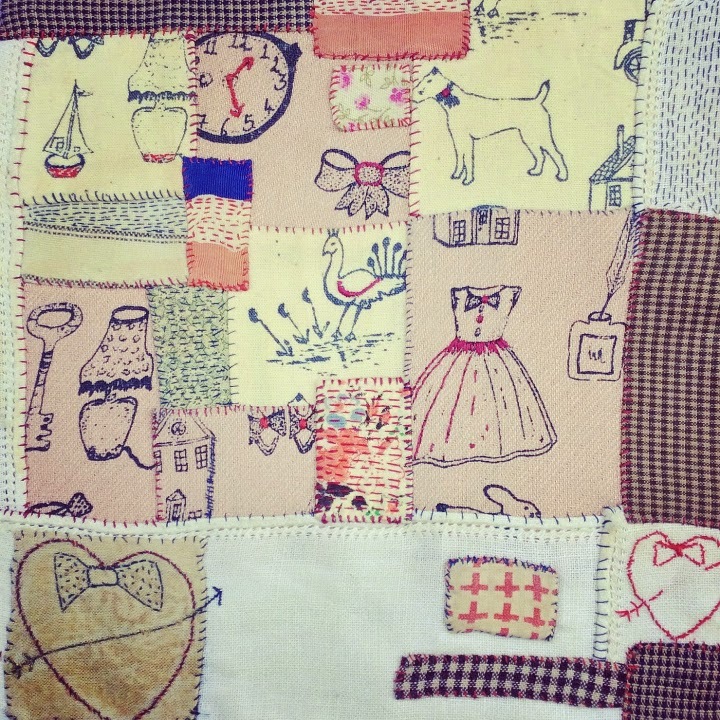 What was the inspiration for your hand stitched souvenir hankies? My current Souvenir Hankies were inspired by a workshop I was invited to run as part of the wedding dress exhibition here in London at the Victoria and Albert Museum. I was asked to base the workshop on one piece from the exhibition and I chose a hand printed paper souvenir napkin from the 1920’s. I was so inspired by this particular piece from the exhibition, so have carried on making my own version of the souvenir hankie. 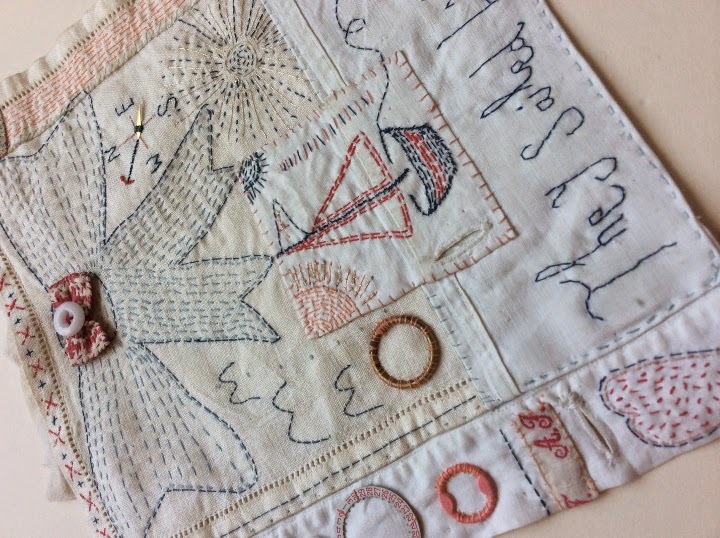 I always use found and old hankies to re work into, adding simple scenes and words and sometimes incorporating simple block print. I have just created two for a couple for their wedding day. How have you become the artist you are today? Determination and a love for making! A lot of hard work and a passion for making. I love to make things so much and now that I teach others my skills as well I find this very rewarding. You need to be quite rounded as an individual to be a maker and shop owner, as running a shop and a business as a maker is very full time. You are constantly surrounded by your own world and the things you make. So having time out and being inspired constantly is also very important, otherwise the love for what you do will float away. I also have many friends who are makers, painters and artists who also have the same life style as me and will go to the end of the line for their own work. And these people are a great inspiration to me. Being the maker I am today is a lifestyle that I have embraced. I have seen so many people that started in a similar way to me destroy their passion and love for making or being creative as they soon have tried to make things quicker and mass produce things. Then you just end up being behind a computer and your hands never get dirty or touch the "materials" again. I knew this was not a way that I wanted to go and always stayed well away from large wholesale orders and commissions and concentrated on smaller and more rewarding commissions and projects and also teaching my skills to like-minded others. My workshops are now a large part of my business and always run just by me, which I think is important as a maker, as teaching others actually feeds back and inspires me as a maker. I feel so lucky for all the wonderful and inspiring people and friends that I have met from running my shop and from running my workshops and are now a large part of my world. My main passion still today after 10 years is "making" and I know deep down this will never change. But still one person can only make a certain amount, so over the last 3 years I have slowly developed a range of items that I get made locally either in London or in the UK. These items like my rubber stamps, screen printed tea towels and some greeting cards then come back to my studio and I finish them by packing them in my particular style. I have never had any business training but I have always had a huge passion for that side of the business. Running the books and paperwork I really love doing as do I like the daily jobs at the shop and I guess it gives me a sense of control overall. When I give my years paper work to my accountant at the end of a year and she confirms all is well this is a great feeling. 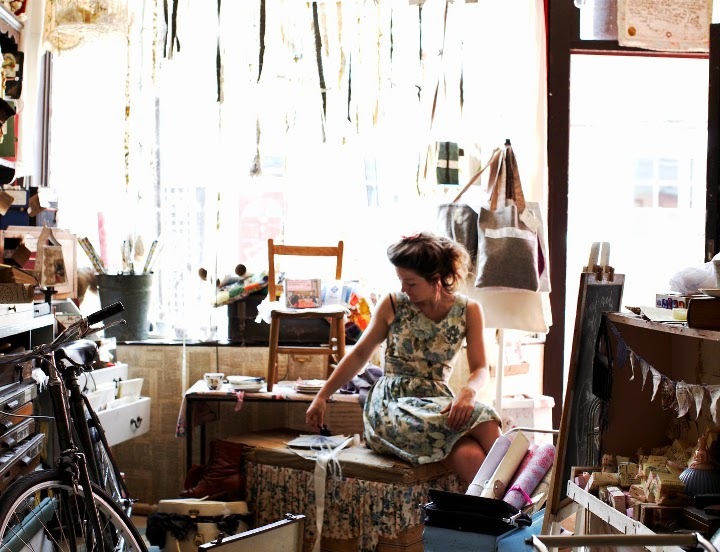 I am very practical as a person so I love the daily running of a shop and this also inspires my work. The two go hand in hand, and on Sundays, when my shop is full of customers appreciating my work, again, this is so rewarding and inspiring. Since a very young age I was obsessed by having my own shop, but at the same time, I knew especially in London that would be a big jump. So since graduating from Goldsmiths College in 2005, I have worked alongside friend and fellow designer Buddug, and because there was the two of us we started the shop together. And now in July this year, after 10 years of our collaboration, I am taking over the shop on my own. For Buddug, her family and Wales has called her back but for me, London, especially Columbia Road and the shop is only just starting. So this summer I am having a 10 years anniversary party on August the 15th and also on this date I will be launching my new book that I am currently working on "Jessie Chorley: Story of a maker". It will also be available online from August the 15th on my web site www.jessiechorley.com and will record mainly visually the last 10 years of my world as a maker. My upcoming and newly laid out shop will also be the main hub for my London based workshops as I now do lots of one on one workshop sessions and also small groups here in London, so to have everything in one place, my shop and studio and workshops, will be great. Embracing social media and selling online has also really helped me become the maker I am today. Most of my online sales I send to the States and to Australia. My blog, www.jessiechorleyinspirations.com and my Instagram feed, not to mention my shop on Columbia Road, are my main source of advertising and I meet and work with so many other creative individuals because of these sources. A salmon pink poem dress. 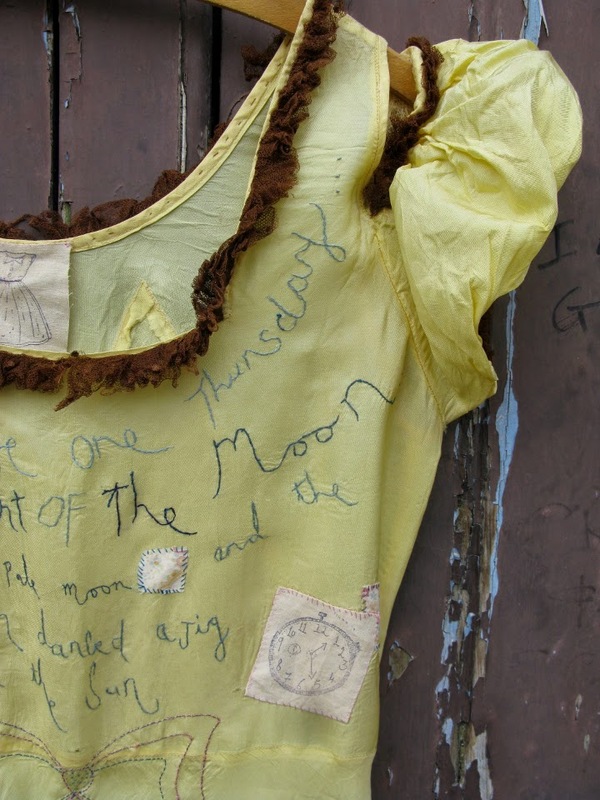 I originally bought the dress from Spitafields antiques market here in East London and I hand embroidered a poem inspired by an Angela Carter novel around the neck. I kept the piece for about 6 years and exhibited it widely until it was bought by a store in Tokyo. I still have many photos of it and have since made a new version on a bright 1930s yellow dress. What is your studio like? What's the most important tool you have there? My studio is currently within a large old factory building out in Hackney Wick. So it is very tucked away and very organised but can also be quite messy, this is what I love about my studio. I often go. There is my work apron and I enjoy getting completely involved, painting, frames, paper mache are all things I enjoy doing here. The studio is quite isolating so I tend to make creative decisions here but then I prefer to do my Embroidery work when at my shop or at home. I get to my studio early in the morning and work fast and then often head to open the shop later on and finish work there. I only have 3 months left in my current studio as in July I am moving my studio to the back of my shop so my current studio is about to be packed up and lots of sorting to be completed before the move happens. Do you have any special rituals while you're working? Lots of tea and I love always to listen to music later in the day and Radio 4 first thing is a must. I never do any computer based work in my studio as this breaks my creativity and mood. You have said you are very inspired by The Museum of Childhood in London. What is your favorite exhibit in there? That is a hard one as there are many. But I am always drawn by a 1930 piece that is a collection of small dolls slightly squeezed into a glass fronted box. It was a personal piece from someone’s home. The box is covered in old green torn paper with a gold tint. What most inspires me about this piece is the way that the box is actually made from an old cupboard drawer with a glass frame attached to the front. You were homeschooled in Wales by your mother, artist Primmy Chorley. What is the best thing you learned from her? "Small is beautiful". This is how I run my business today, keeping things small but keeping the passion. Her love of collecting and making is deeply embedded in me as a maker not only in my work but also in the way I run my home. To follow Jessie's story, shop online, and view her upcoming workshop dates, visit www.jessiechorley.com. Jessie will be teaching her first workshop ever in the US in Santa Fe, New Mexico, September 15-19, 2015 - details can be found at www.womanwithaneedle.com. Thank you so much to Karen Thiesen, for providing this wonderful interview, and thank you to Jessie Chorley for a wonderful glimpse into your life as an artist, and your process! Now, for an exciting giveaway - Jessie has created one of her signature brooches as a giveaway for one very lucky Feeling Stitchy reader! 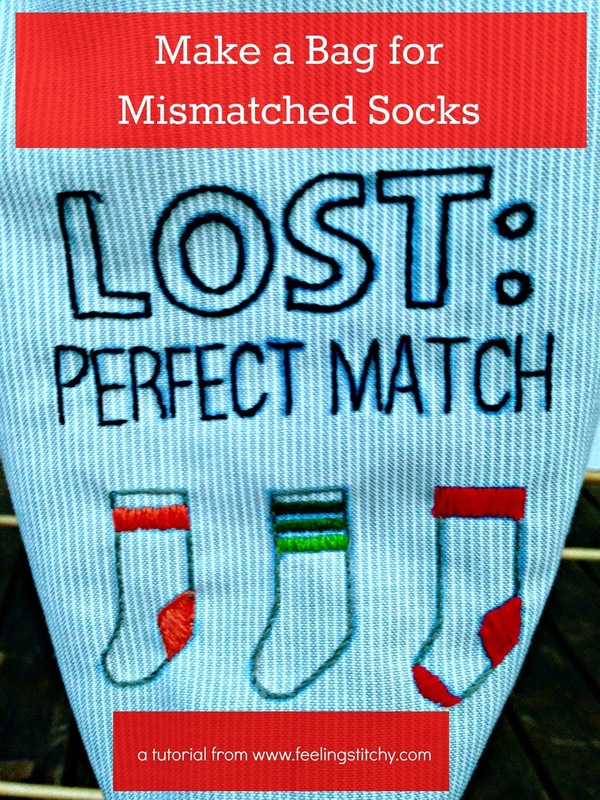 This giveaway is open to all of our readers. To win Jessie's beautiful handmade brooch - simply leave a comment on this post by 9 PM US CST on Monday, April 13 - and answer this question: If you could have a studio to embroider, make art, and craft in - what would your dream studio look like? During my work placement I have been consistently inspired and sometimes overwhelmed. From the environment to the array of exquisite samples and materials, there is continually something which whets my creative appetite. Hand & Lock’s quintessentially English meeting room is known in-house as the ‘bead room’. 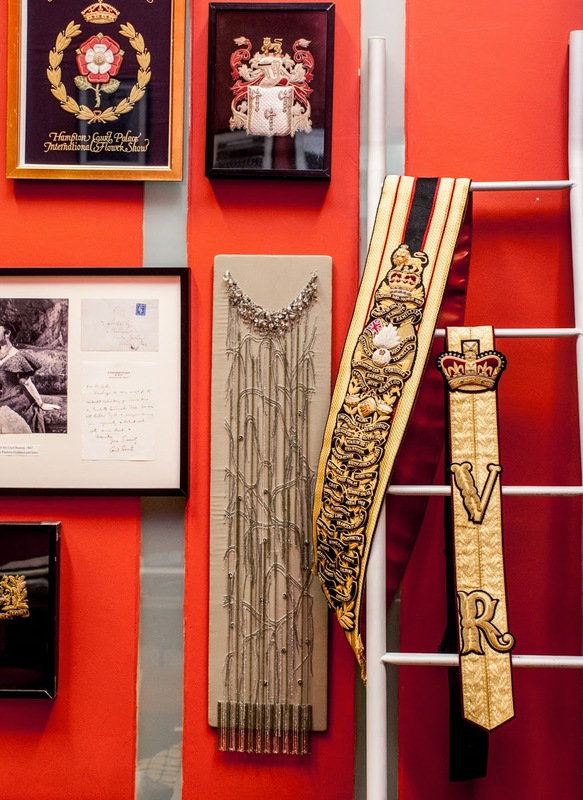 Its walls are decorated with lush embroidery samples and military regalia. Ceiling-high cabinets line the edge of the room and house a vast variety of beads and an extensive collection of samples. I believe it could take a day or two to peruse through the entire archive. 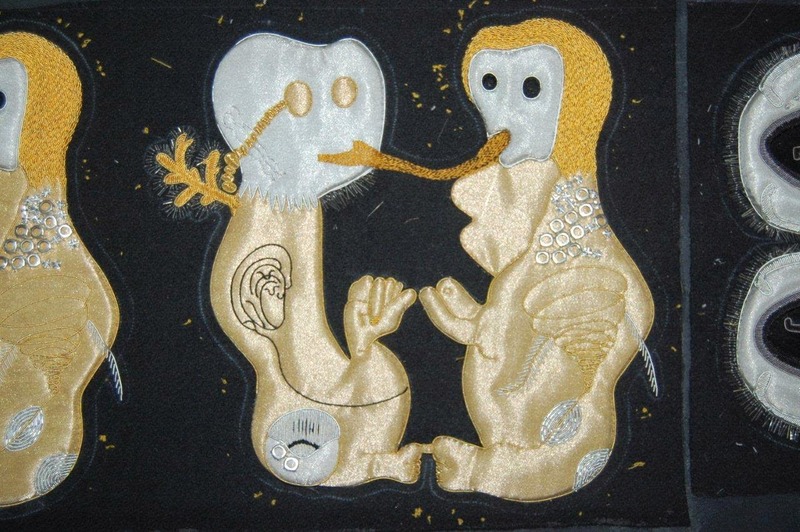 Each design is different and almost every type of embroidery is displayed. It’s such a pleasure to be able to thumb through such a beautiful collection. I quietly imagine the ways I could apply some of these techniques and styles to my own work and how I could adapt them. Although I will have to learn how to execute them first. Certainly another great inspiration for me is the array of materials. It’s also interesting to learn why each piece is selected for use. One reason is that the fabrics, beads, threads and other decorative objects all project a particular impression and impact and the way that they interact with each other also plays an integral factor. I am also noticing how a particular material can be fundamental to a design. In using an object which is not commonly adopted in couture embellishment the unusual texture and shapes can project a different effect. 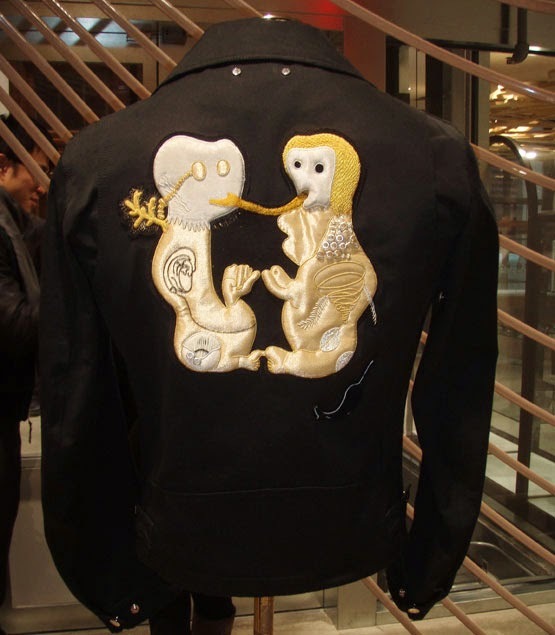 The collection features lavish and extraordinary designs by the artist Terence Koh and the unusual materials used by the Hand & Lock team complements the artist’s quirky style. Most importantly, a primary source of inspiration for me is the environment itself and the people in it. When I take a moment to look around the atelier I see inspiration at every angle. Creativity almost pulses under its beams.